Joe Massengale rose above his hardscrabble roots to become a successful Beverly Hills businessman, creating a tree service from scratch and building it into an enduring and profitable enterprise. Through years of hard work, Joe achieved the prosperous life he sought but never forgot the life lessons he learned along the way, especially those his father Hugh taught him. He made sure to impart those lessons to his six sons, each of whom became a success in his own right. 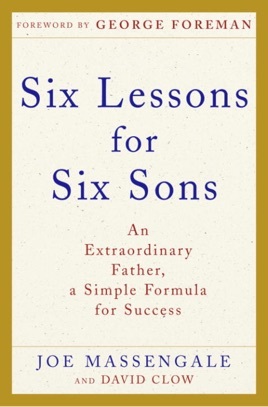 What his sons learned from Joe—what it means to be a man, a father, a son, a productive member of society, a person of integrity—is brought to life in Six Lessons for Six Sons. Joe tells his story in vignettes interwoven with observations from his sons, who talk about how they’ve put these simple yet resonant values into practice. Notable contributors—including Guy Bluford, the first African-American in space; Academy Award–winning actress Anjelica Huston; and Olympic Gold Medal–winning decathlete Rafer Johnson—offer perspectives on how the messages at the core of Joe’s story have enriched their own lives and, most important, how they can enrich yours. Six Lessons for Six Sons is a proven blueprint for personal accomplishment and fulfillment, a stirring story of one family’s journey through a century of American change, and an inspiration for anyone who wants to become a positive role model for others. What if success was as simple as six lessons? Believe in yourself, and other people will, too. Find the strength to keep trying, no matter how hard you’ve tried before. Pride is a commitment: to your family and—most of all—to yourself. Learn from your triumphs but also pay attention to what the hard knocks have to teach you. Fear is always looking for a crack in your foundation. Keep yours solid. You are free to be the person you want to be—but you have to work for it. In a folksy tone, with the aid of business writer Clow, Massengale, now in his 70s, tells how he overcame great odds and successfully raised six sons. As a boy, Massengale witnessed his father, Hugh, being knocked to his knees in Marshall, Tex., when he stood up to a white man who owed him money. Despite desperate poverty, Hugh imbued his son with the confidence to survive; in 1947, Joe started a landscaping business in California. He passed this confidence on to his sons along with five other lessons: fortitude, pride, persistence, fearlessness and focus. In each chapter Massengale and one son together reveal how one of these traits influenced their lives. For example, Michael, who returned to his first love, acting, at age 40 after practicing law, believes he was given the gift of fortitude in order to pursue his difficult career. Perhaps the toughest challenge for Massengale was to instill focus in his youngest son, Andre, who is mildly autistic, and help him gain an independent life. The book is inspiring, and Massengale's "regular guy" voice and emphasis on honesty and values will resonate for many readers.